- not the version I read. A gently sinuous line, superimposed like the orbit of a satellite over a map[i] of the continents, traces the travels of Ruggiero, a courageous knight errant, who, a millennium before the first manned spacecraft, rides astride the back of a flying hippogryph, a winged half-lion, half-horse, to survey the world from Spain to China, from Japan to Paris. This voyage is but one of the many delightful surprises in Ludovico Ariosto’s 16th century poem, Orlando furioso, and its deliberate internationalism but one remarkably modern element in Ariosto’s lightly satirical world of starkly bold, memorable characters; codes of courtesy and dignity; rich inventiveness; and philosophical musings on aspects of love. Across the entirety of its 39,000 lines, Ariosto’s work is unflaggingly fresh, good-hearted, and supremely entertaining. The sheer ambitiousness of the poem - Voltaire referred to it as “The Iliad, The Odyssey and Don Quixote all rolled into one” - creates an immense panorama of the 9th century world in which Ariosto situates most of the action. At the historical heart of Orlando furioso is the battle to defend Charlemagne’s Christendom against the onslaught of Moors and Saracens, with depictions of key confrontations including the siege of Paris and the decisive battle at Poitiers. The poem ranges widely geographically and even, beyond Ruggiero’s stratospheric travels, to the moon. Ariosto also cuts broadly across cultures, amplifying and playing with hand-me-down versions of Anglo-Saxon, French and Italian romances and an enormous cast of historical and mythological figures from Greek gods to African kings, from Tristan and Iseult to the Arthurian legends, from the Icelandic sagas to Marco Polo’s travels. A glossary of locations and characters in the Oxford Press edition I read runs to nearly 60 pages. Christians from all corners of Europe, Saracens and Moors from North Africa and the Middle East, Indians, Nubians, Ethiopians, central Asians, Circassians, Nordic and Chinese princesses (Orlando’s great love, Angelica, hails from Cathay) - all come together here. 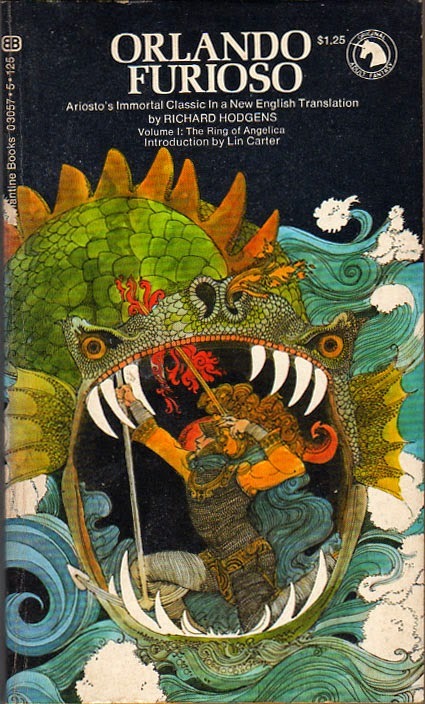 Tales of courtly love, knightly challenges, and fierce battles of a frequently gruesome realism entwine with acts of magic, supernatural feats, enchanted castles and hideous sea serpents, and deliriously imaginative inventions. In addition to the lightening-fast flying hippogryph, there’s a cornucopia of magical arms, adornments and devices: a shield so brilliant that it temporarily blinds any who look at it; a horn that produces such a terrifying sound that even the bravest knights flee in terror; books of spells; a ring that deflects any and all magic; a castle that causes all who enter to perceive illusions. He who travels far afield beholds things which lie beyond the bounds of belief; and when he returns to tell of them, he is not believed, but is dismissed as a liar, for the ignorant throng will refuse to accept his word, but needs must see with their own eyes, touch with their owns hands. This being so, I realize that my words will gain scant credence where they outstrip the experience of my hearers./Still, whatever degree of reliance is placed on my word, I shall not trouble myself about the ignorant and mindless rabble: I know that you, my sharp, clear-headed listeners will see the shining truth of my tale. To convince you, and you alone, is all that I wish to strive for, the only reward I seek. A work with as grand and rich a scope as Orlando furioso can hardly be encompassed briefly, so I’ll just note two elements of the poem I especially appreciated: the manner in which Ariosto creates a remarkably tolerant and open-minded ethos around prescribed codes of behavior, and the poem’s notable feminism. The code of honor that permeates Orlando furioso reveals itself in a myriad of guises. One is the priority given to individual heroism and character over cultural or even religious persuasion. The principals in the poem hail from different lands and different religious traditions. Ruggiero fights on the side of the Sultan, for instance, and though the ostensible moral core of the work may rest with the triumph of Christendom, Ariosto often celebrates the personal virtues of Christians and Muslims alike; by contrast, the larger theological battle is treated almost incidentally. Many times, out of personal loyalties and obligations, his characters fight for parties on opposite sides of their own ideologies. Only in the poem’s final pages are religious allegiances rather hurriedly herded into line by Charlemagne’s victory. These codes, which extol personal courage and prowess, respect and tolerance, and a strong sense of justice, reveal Orlando furioso’s unabashed (albeit not entirely secular) humanism; despite the narrator’s frequent invocation of God, Christ is almost completely absent from the poem. Combined with the unusual universalism of the poem - a work in which, with a palpable poignancy, one can look back from the moon and just descry the “unilluminated” Earth – the qualities exalted by the narrator infuse the poem with an astonishing freshness and forward-looking modernity. The poem’s feminism is another aspect of this freshness and modernity. Samuel Butler, in his 1897 book The Authoress of the Odyssey, argued that Homer’s epic had been written by a woman, but save for the historical record Butler might well have proposed a similar hypothesis for Orlando furioso. Ariosto’s poem frequently denounces the injustices directed towards women and contains a memorable cast of active, daring female characters who challenge and subvert accepted notions of courtly love and of gender. While Ariosto ostensibly follows the staple pattern in romances of exalting and idealizing the virtues of women (the male knights errant are motivated almost entirely by pursuit and defense of lady loves worshipped from afar), many of the women of Orlando furioso are courageous fighters, astute tacticians and sexual libertines. Early in the work, a brave knight, after defeating another, dramatically whips off his helmet, and, with long tresses falling, reveals herself as Bradamant, an expert in combat. In a later scene, the skilled woman warrior Marfisa performs the same dramatic trick after winning escape for her shipwrecked colleagues from a matriarchal “city of killer women,” turned vengeful and murderous by the wrongs of men, and who send their strongest male slaves to battle with any hapless captives in a contest for their freedom. If the same ardour, the same urge drives both sexes to love’s gentle fulfillment, which to the mindless commoner seems so grave an excess, why is the woman to be punished or blamed for doing with one or several men the very thing a man does with as many women as he will, and receives no punishment but praise of it?/ This unequal law does obvious injustice to women, and, by God, I hope to show how criminal it is that such a law should have survived so long. The broad-minded receptivity of Orlando furioso, reinforced by the playful bantering tone of its narrator, embraces an optimal world that celebrates joy, desire, and lightness of heart, one where “dancing and play-time, and the hours went by in one continuous festivity. Grey-headed Thought could not dwell here in a single heart, not even for a moment.” Though such a world may be nearly unattainable in reality, Ariosto has supplied his readers its literary equivalent, a poem that, with such openness of spirit and amiable narration, and despite its length, one is sorry to see come to an end – the kind of book to make much other literature, regardless of period, seem stale, circumscribed and even retrograde by comparison. [i] This map is one of two in Barbara Reynolds’ Penguin Books translation, which makes a helpful supplement to the Oxford Press translation by Guido Waldman upon which I principally relied. Waldman explicitly notes that his prose translation is an effort to focus on sense more than sound, a way of maneuvering around the plethora of rhyming word endings in the original Italian ottava rima. Reynolds’ attempt to keep to the rhyme scheme for Orlando’s 39,000 lines is nothing short of heroic. Switching back and forth between the two versions proved revealing and rewarding. [ii] An interesting speech to bring to the table in a debate with a gun fetishist. In taking a chance with a relatively unknown work of literature, one sometimes turns up buried treasure. 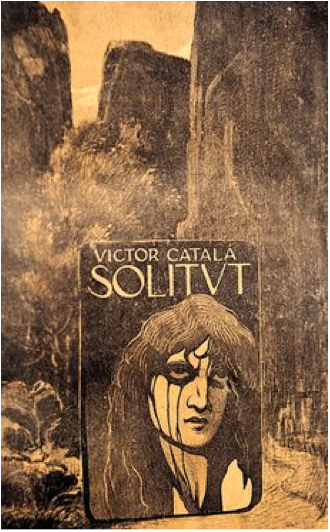 Victor Català’s 1905 novel Solitude, for me, is one such work; more than a few of its indelible scenes have settled in for good. I’m probably not alone in my ignorance of Català, whose fame has remained largely within Catalonia, where the author is regarded as among the finest of 20th century Catalàn writers, primarily due to Solitude and its pioneering depiction of female sexuality and desire. Català’s absurdly patriotic name, meaning “Catalan Victory,” is rather obviously a pseudonym. It belonged to Caterina Albert i Paradís (1869-1966), a writer of poems, plays, numerous short story collections and two novels, whose early work garnered swift attention and high praise. Following Solitude, however, Albert published only sporadically for the remaining 61 years of her life. Assuming the rest of her work is anything like this exceptional novel, those periods of silence may represent a substantial loss. broad and soft as a pillow, strained against the black jacket that stretched from armpit to armpit, as if in constant danger of ripping asunder. ‘How fat he’s gotten since we married,’ thought Mila, remembering how tight all his clothes had become, so that he seemed crammed into them like a straw doll in its rags. Once installed at the hermitage, a “house full of bolts” described with as much melancholic intensity of feeling as Buzzati’s mountain fortress, Mila begins tackling years of neglect. Over weeks she spends scrubbing walls and floors, clearing cobwebs, and dusting the figure of St. Pontius and the chapel’s morass of relics, Mila’s recognition of Matias’ laziness and indifference to her own needs crystallizes. Her almost complete isolation is otherwise peopled only by a kind shepherd, Gaietà; his eight-year-old assistant Baldiret; members of Baldiret’s family from the nearest farm, including Arnau, who develops a strong attraction to Mila despite his betrothal to another; and Anima, a louche, nearly feral peasant, “more beast than man,” who survives by hunting rabbits with a ferret he calls his “wife” and whose unexpected, irruptive visits to the hermitage provoke unease. Given this stage-small cast of starkly defined, even symbolically named characters, the reader can discern early on, helped by ample foreshadowing, the direction interactions between them are likely to take. Any predictability, though, is more than outweighed by Albert’s inventiveness, bold, precise descriptions and distinctive style, and by the grand landscapes against which this drama plays out. Approaching the end of Solitude, I began to wonder the same thing that Mila herself articulates: “What else could possibly happen?” For despite flashes of happiness and pleasure, Mila’s life reads like a catalog of drudgery and misfortune. As her husband spends more time with the miscreant Anima and in gambling away the couple’s meager savings, Mila’s isolation increases, leaving only Gaietà and Baldiret, while not tending their flock, as companions and protection against Anima’s disconcerting appearances. …an espadrille, a new jug, a dirty napkin tossed behind some blackberry bushes, a pocket knife amid all the refuse: greasy paper, orange peels, squashed roses, well-gnawed spare ribs, bits of chicken covered with black ants, dead campfires…all the festival’s repulsive debris. diminutive lamps [that] glowed in the mountains’ high solitude, where the scent of violence still seemed to linger, and outlined the hermitage with tiny points of light, making it look like a fairy palace in one of Gaietà’s stories. In these stories, slipped contrapuntally in among passages chronicling the hard life at the hermitage, Gaietà recounts enchanting, occasionally gruesome folkloric legends sprouted “from every field, rock and branch,” and that draw on Catalonia’s Aragonese and Moorish past as well as the gloomy history of the hermitage itself. Under their spell, Mila emerges from her solitude and finds herself drawing closer to the shepherd, both alarmed and pleased by the feelings he arouses in her. The young Baldiret too gloms hungrily onto any suggestion of story, a precious resource in a life of such scarcity and deprivation. This weight of ancient myths on the present, making almost palpable the fantastical world of fairies, spirits and phantoms, is reminiscent of the novels of Albert’s Sardinian contemporary Grazia Deledda, as is the nearly ethnographic attention Albert lavishes on particulars of rural customs and superstitions. One comes to know the landscapes, flora and fauna, peoples and manners of the region. In contrast to Deledda’s gauzy evocations, however, Albert’s descriptions are hard-edged, physical, raw. Her focus on the poverty and harsh, sometimes violent quality of life in the mountains also calls to mind the alpine novels of Charles-Ferdinand Ramuz, with whom she shares a similar painterly, almost cubistic style of description. Though literary portraits of women trapped by marriage and other social institutions and tormented by desire are hardly unusual, Albert’s protagonist perseveres in ways that contrast strongly with female characters of an earlier generation. Unlike Flaubert’s Emma Bovary or Ana Quintanar in Leopoldo Alas’ novel La Regenta (with whose life, though of a completely different class and social milieu, Mila shares many similarities), Mila, in an effort to extract herself from her oppression, wages a defiant protest against her condition. Solitude, with its carefully constructed, intrepid aesthetic pleasures; agility and modernity; and powerful portrait of female conviction and courage, is a novel I’m pleased to have discovered and eager to pass along. I’ll be equally eager to read Caterina Albert i Paradís’ second, more experimental novel - the intriguingly titled Un Film (3,000 Metres) (A 3,000 Meter Film) - should it become available in English translation. Solitude is translated by David H. Rosenthal and published by Readers International. I learned of the book when translator Peter Bush mentioned it during a recent talk.